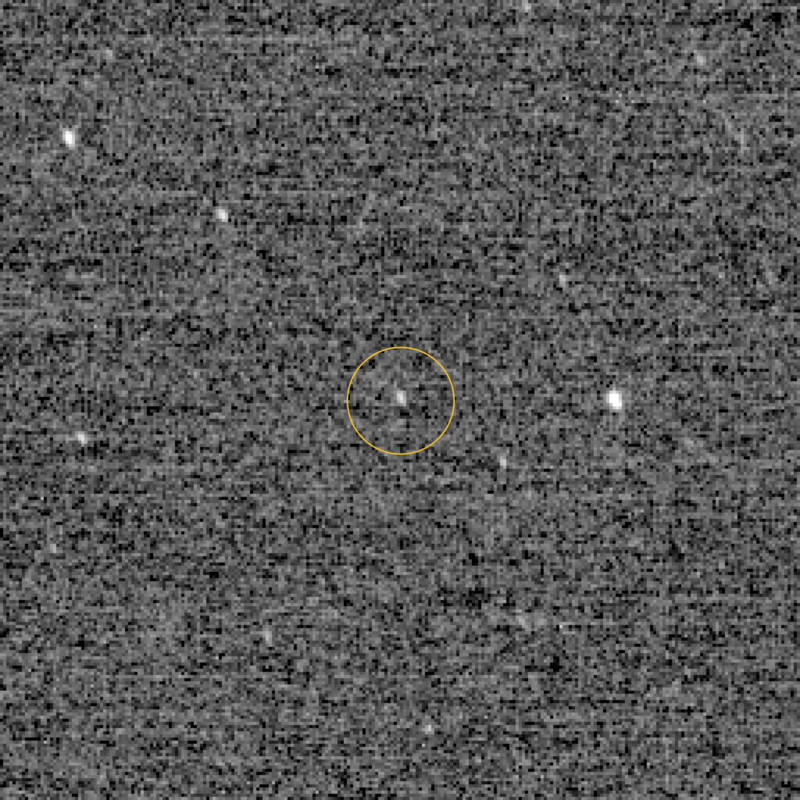 This image shows the first detection of 2014 MU69 (nicknamed "Ultima Thule"), using the highest resolution mode (known as "1x1") of the Long Range Reconnaissance Imager (LORRI) aboard the New Horizons spacecraft. Three separate images, each with an exposure time of 0.5 seconds, were combined to produce the image shown here. All three images were taken on Dec. 24, 2018, at 01:56 UT spacecraft time and were downlinked to Earth about 12 hours later. The original images are 1024 x 1024 pixels, but only a 256 x 256 pixel portion, centered on Ultima (circled in orange), is displayed. The other objects visible in this image are nearby stars. At the time this image was taken, Ultima was 4 billion miles (6.5 billion kilometers) from the Sun and 6.3 million miles (10 million kilometers) from the New Horizons spacecraft. Previous LORRI images of Ultima required using its lower resolution mode ("4x4"), which has one-quarter the resolution of 1x1 mode, and longer exposure times, 30 seconds each for the images taken from mid-August through early December 2018. The new higher resolution images taken from now until New Horizons’ Jan. 1 flight past Ultima on will enable better optical navigation to the small Kuiper Belt object and higher spatial resolution searches for any nearby moons.